Update: I’ve re-worked this post as I noticed all of the links were broken – sorry for any inconvenience caused. In this last post in the Managing Web Projects series, I’ll take a brief look back at what we’ve covered and then offer a few more hints and tips to help all you budding freelancers out there – aren’t I nice?! This is where it all began with a brain dump into FreeMind, I’ll admit that it doesn’t cover every aspect of the Web Development process but it’s a jolly good starting place! The mind map tries to organise the different areas into silos which could then be used to formulate a work-flow. The website work flow diagram takes the mess that was the Brainstorm and organises it into a logical flow of what (in an ideal world) should happen when during the life-cycle of a project. The workflow diagram then lead me to write the rest of the processes in a (hopefully) logical order. The pitch could be considered the most important part of the web development process. Pitch badly and you won’t get the work so the rest of the project flow is useless! In this post I discuss some tips and techniques for successful pitching such as using (or not) your notes properly and pitcing your pitch at the right level. Here I discuss how to work out your hourly rate as a freelance web developer (and how not to to over or under-charge!) and how to send out your quote; Professionalism counts – don’t hand it to them scrawled on a soggy beer mat! All I’m going to say about this one is never, never, never, never do work for anyone (not even your Aunty May) without even a basic contract. One of the most important aspects of the Project Management life-cycle. It specifies what you’re going to build and how it’s going to work. If you don’t write even a basic Technical Requirements specification you run the risk of being stuck in the never ending cycle of project creep – you have been warned! This entry offers advice on working out how many team members you need and what to do when you hire them. Don’t worry if you’re a one-man-band, this post offers some insights into project management and some useful tools. Here we take a brief look at the process of designing a website (a full book in itself), what you need to consider and how to track the many changes that are bound to happen. Again, worthy of its own book! We take a look at the development of a website, the tools to use, bug-tracking and design integration. Don’t you just hate it when you visit a website and half the functionality is broken? Or maybe you’re a Mac owner who can’t access half the websites on the Internet because no-one bothered to test them on OSX? I suppose you could just slap an “In Beta” sticker on the site…. or maybe you could test it? Here we consider how to test and what to test for before you release the site on the unsuspecting public. At some point your client’s bound to turn around and say “I want…” so here we discuss tracking the changes, and when to turn around to your client and say “No”! Here we talk about why you should get a formal sign-off from a client (hint, you can’t get sued) and what it should include. We also discuss how to roll your website out to the big-wide-world. This post discusses when and how to invoice your client and what you should include on your invoice. In this final post, the topic of website maintenance is discussed. For some developers it’s the most boring job in the world, for others it’s their main source of income. Here we talk about why providing maintenance updates is an excellent value added service and how to go about managing them so you, and the customer, don’t lose out. Phew! It’s been quite a journey hasn’t it? I’ve tried to cover as many aspects of the development process as I can, most of it coming from my personal experience being a web developer for the past ahem years – yes, I was there when the dot.com bubble burst. Web 2.0 fever is striking the internet world and there’s nothing to say that the bubble won’t burst again. 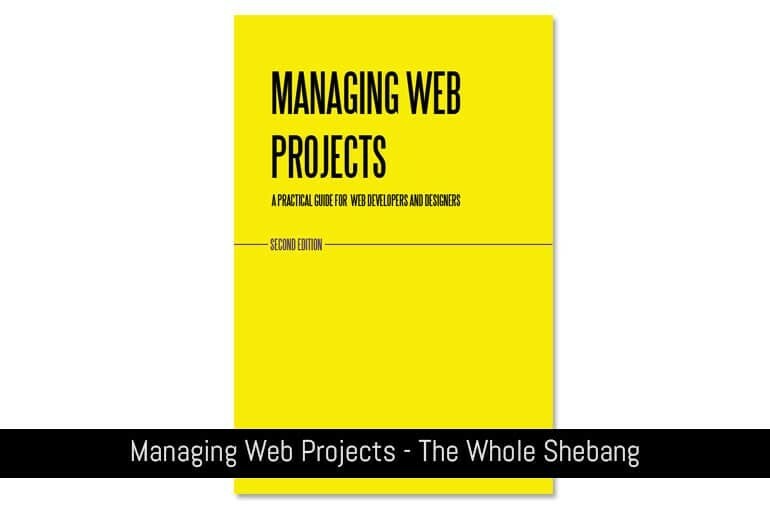 Hopefully the advice I have put forward in the “Managing Web Projects” series will help you stay afloat in any turbulent times ahead. I’d also like to think that the processes I have mentioned will help you deal with clients and staff and hopefully take the stress out of a job that can be is immensely enjoyable. This series is by no means meant to be all encompassing, but I think I’ve touched on all the main aspects of web development that will affect all of us at one point or another. If you have any suggestions or comments about this series, please feel free to add them to the relevant entries, post them below or sent me an email using the link at the top of the page. If it can go wrong it probably will so have processes in place to deal with it. Just because a customer wants it doesn’t mean they have to have it. A verbal contract isn’t worth the paper it’s written on. Document everything and get it signed! Always write a technical requirements specification – no matter how brief. You’re client knows what they’re getting and you know what you’re meant to deliver. That way there can be no arguments. The customer isn’t always right. If they are a pain in the backside, are they worth working with? Test, Test and Test again. There’s nothing more damaging to your reputation (and your client’s) by releasing something that breaks when a user enters an invalid email address. Finally, beware of undercharging. When quoting always add leeway for problem code, problem clients and general problems. You don’t want to be out of pocket. Webmaster World – A friendly forum with topics on web development, project management, SEO and more. Web Monkey – An oldie but a goodie. It may not be updated much anymore but the article archive is a goldmine of information. ASP Index, Hotscripts, DHTML Central and Planet Source Code – Why re-invent the wheel when there are so many great free scripts already out there? Small Business Advice From Digital.com – From Web Hosting reviews to podcasts and ebooks for small business owners there’s advice for all types of business owners. The above is just a sample of the wonderful resources out there for web developers, designers and project managers – please feel free to add more in the comments! Thanks for reading and I hoped you enjoyed the series.